Waiting is literally a pregnant activity. It is what expectant mothers do of course, but it's something that bears fruits that are not always the anticipated end of the act itself. Common situations in which people wait are airports (where flights are frequently delayed), auto repair shops (where cars are rarely if ever ready when they're supposed to be) and most dramatically the waiting rooms of offices where patients are often waiting for results. Those being tried for crimes have to wait for the verdict of the jury and you've undoubtedly seen these dramatic moments when the judge reads a guilty or innocent verdict based on a jury's deliberations on TV. In the most dramatic instances life itself is at stake. But in everyday life, which is filled with moments which have little to do with criminal matters, the end result of waiting can be rather prosaic. Samuel Beckett wrote Waiting for Godot and lots of people mistakenly think the play is about God or answers. 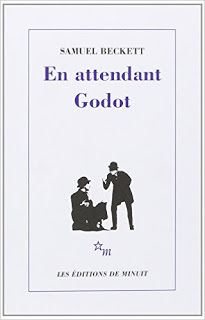 But Beckett wrote Godot in French and the French title, En attendant Godot, "while waiting for Godot," throws a light on what the playwright was getting at. The play is not about waiting for anything to happen, as the theater critic Richard Gilman liked to point out. It's about what one does while one is waiting. So the next time you find yourself waiting for a hamburger, on one of those long lines a Shake Shack, don't even entertain the notion that there is an end in sight. Once you get your food, you're simply going to scarf it down. What's more important is what happens, the interactions, the perceptions, the conversations you might have, before you satiate your appetite.